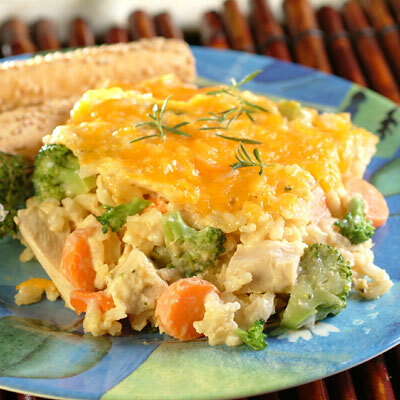 Creamy Chicken and Rice Bake is a quick and hearty meal for your family! Terrific to serve on a hectic day. Ready in just 1 hour. COMBINE evaporated milk and cream cheese in baking dish with wire whisk until smooth. Add soup, water, garlic powder and pepper; mix well. Add vegetables, chicken and rice. Cover tightly with foil. PREPARE as above; do not bake. Do not top with cheddar cheese. Cover; freeze for up to 2 months. Thaw overnight in refrigerator. BAKE, covered, for 45 to 55 minutes. Uncover; top with cheddar cheese. Bake for an additional 10 to 15 minutes or until cheese is melted and mixture is bubbly. Let stand for 5 minutes before serving.